If you’ve followed my blog for a while, you know I have an unhealthy addiction to anything and everything with a tassel on it. Doesn’t it just seem though that when you put a tassel on it (and by it, I really do mean anything/everything) it automatically makes it 10 times better? When I saw this necklace and this bracelet set on Bauble Bar, I instantly knew I needed them in my accessory auxiliary! Not only do they have tassels, they are also super fun and bright and will pair perfectly with just about anything this summer! For a fresh spring look, I paired them with white denim and a chambray top. 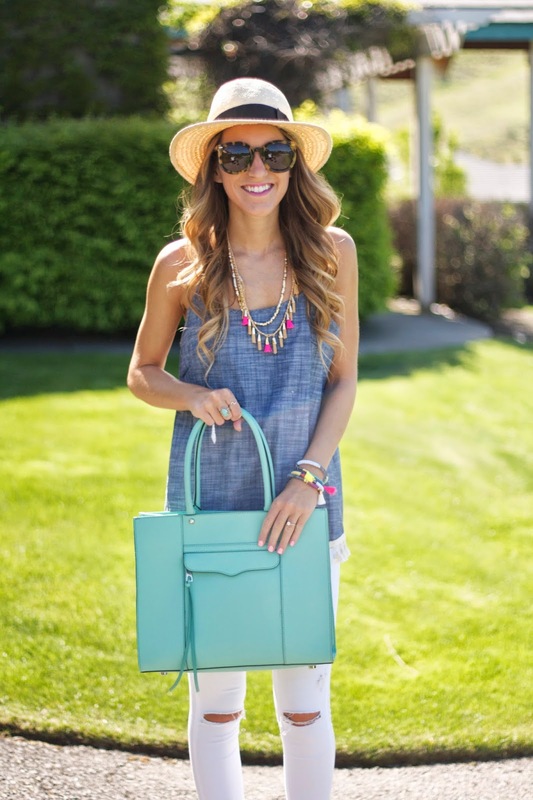 However, this Kelly Fields Boutique chambray tank isn’t just any chambray tank…look closely…it has TASSELS! This top needs to be in your wardrobe ladies! It is such a fun spin on chambray, because as I said before, putting a tassel on it always makes it better! This is the perfect spring look! I love it! Love all the details in this outfit. Perfect for spring! hi! thanks for it.it's very interesting this blog…. courses after 12th science membership of a professional body is synonymous with certification, though not always.